When Tiff and I moved into Brookland, we’d heard about the Franciscan Monastery, but seeing the beautiful grounds of this place was something else. Nestled into the hill north of Monroe Street and East of Catholic University, the gardens and the incredible architecture make this place into something out of a story book, or out of an Italian countryside. 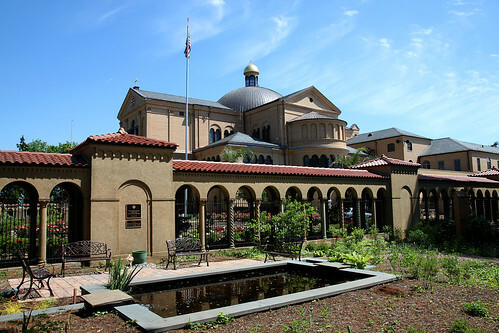 The large building in the center of the grounds is The Memorial Church of the Holy Sepulchre, and was built in 1899 by the Franciscan Order and designed by Aristide Leonori. The grounds include an incredible garden, cared for by their Garden Guild. Guided tours of the high-ceilinged church and the gardens are available on the hour Monday through Saturday starting at 10am and going til 3pm, or self-guided tours of the gardens and grounds are available from 10 to 5 any day. Mass is said in the Chapel every day, and masses are open to the public on Sunday mornings. How to Get There: Served by the H6 Metrobus, it’s a quick trip from the Brookland Metro, and you really have to see this one to believe it. One second, you’re in Northeast DC, and then you cross through that gate and you’re somewhere else entirely. Walking through the outer open air hallways, it’s like you’re in the middle of the countryside somewhere, in a refuge from worldly care. 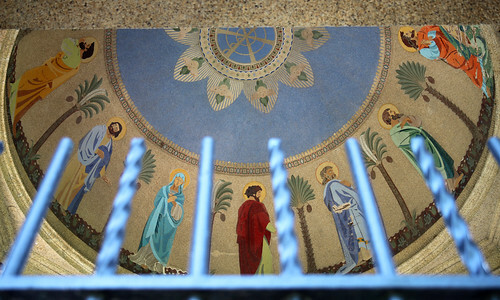 What Not to Miss: All through the covered walkways are Marian prayers in every conceivable written language, and the artistry of the stonework is amazing. Take note of the rose garden, too, they sell cuttings every spring, and we’re just about due for their annual rose sale. There’s no place in DC quite like the Monastery, it’s worth a trip if you’re feeling in need of a bit of rest. Next weekend, they will hold mass in their recently renewed Monastery Church on the ground at noon, and there will be a reception in the Cloister Garden, which is not usually open to the public. The reception cost is $35.